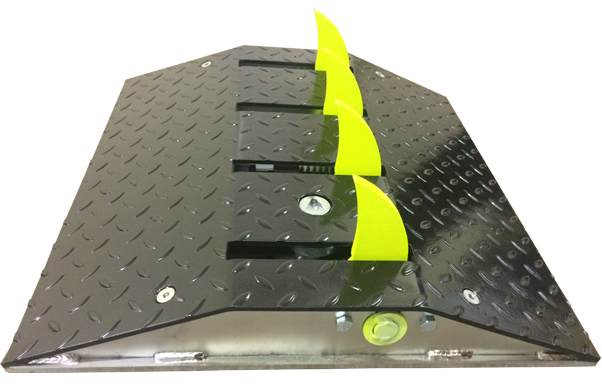 The ultimate one way or bi directional surface mounted traffic spikes. 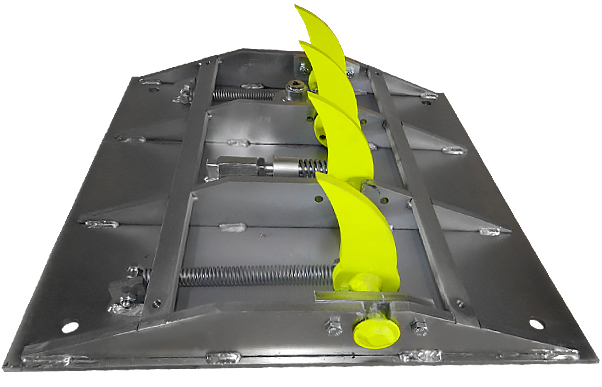 Designed and manufactured in the UK to handle vehicles of all sizes and volumes. 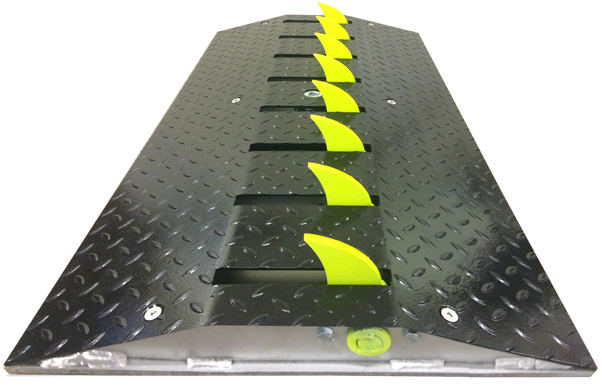 GATECLAW One Way Traffic Spikes are designed and manufactured in the UK by SAE Systems Ltd. Our systems are made of high-quality, very heavy-duty steel and are designed to handle multiple vehicles of all sizes and volumes. 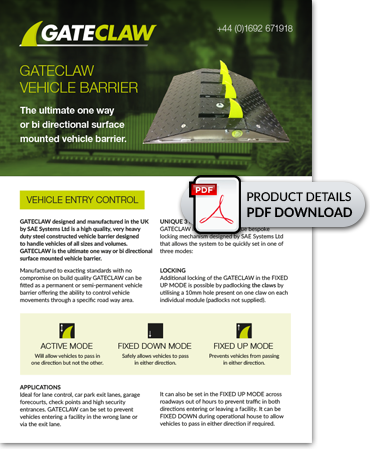 Manufactured to exacting standards with no compromise on build quality GATECLAW can be fitted as a permanent or semi-permanent vehicle barrier offering the ability to control vehicle movements through a specific roadway area. 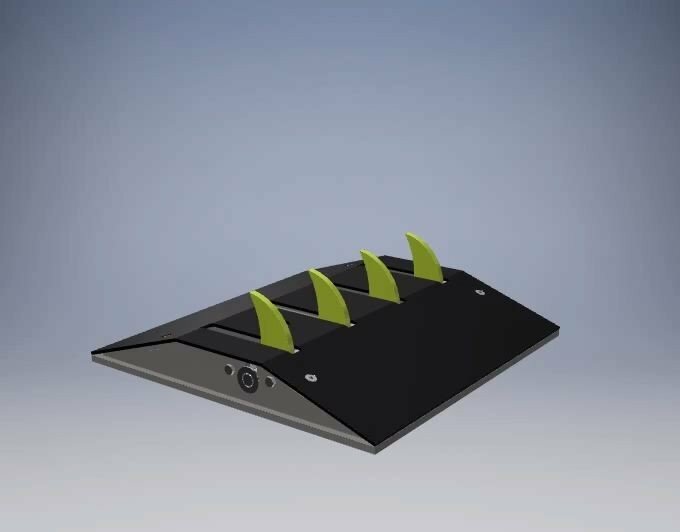 The unique claw design will effectively puncture vehicles tyres transiting the GATECLAW in both the active mode I,e against the direction of the Claws as well as in the locked up mode in both directions. UNIQUE 3 MODE MECHANISM – GATECLAW is fitted with a unique bespoke locking mechanism designed by SAE Systems Ltd that allows the system to be quickly set in one of three modes (please see graphic shown below). The units are supplied with a long-handled T bar key enabling the operator to physically set the MODE quickly in a matter of seconds. LOCKING – Additional locking of the GATECLAW in the FIXED UP MODE is possible by padlocking. The Claws by utilising a 10mm hole present on one claw on each individual module (padlocks not supplied). APPLICATIONS – Ideal for lane control, car park exit lanes, garage forecourts, checkpoints and high-security entrances. GATECLAW can be set to prevent vehicles entering a facility in the wrong lane or via the exit lane, it can also be set in the fixed up mode across roadways out of hours to prevent traffic in both directions entering or leaving a facility. It can be fixed down during operational house to allow vehicles to pass in either direction if required. Will allow vehicles to pass in one direction but not the other. Safely allows vehicles to pass in either direction. Prevents vehicles from passing in either direction by puncturing tyres.